I can't think of a more authentic experience that I've had teaching poetry with my students than through the incredible power of slam poetry. Here in Chicago, we're lucky. The slam poetry scene is strong. We're actually the city that gave birth to the slam poetry movement in the 80s. Blue collar, steel worker Marc Smith decided that he was sick of the elitist stigma attached to poetry and he was determined to change that. With a drink in one hand and a poem in the other, Marc Smith took the stage at the Green Mill Lounge (formerly one of Al Capone's secret hideouts), and began building the slam poetry movement. From there, Chicago continued to grow on the poetry scene as the famed Louder Than a Bomb was created for the youth in Chicago as a way to patch together a massively segregated city. Louder Than a Bomb is the world's largest teen poetry competition and cities all over the world are starting to create their own Louder Than a Bomb tournaments. We had the incredible opportunity to bring teams several years in a row to competition: we took kids from mixed backgrounds, all different kinds of stories, wrote poems, practiced and rehearsed them, and finally performed them on a stage in front of total strangers and five judges. Slam poetry is a competitive form of spoken word poetry. Students can perform poetry all they want, but for it to be a SLAM poem, that means that it's ready for battle! The idea of poetry being a "competition" is ludicrous, as admitted by founder Marc Smith. As the saying goes, "the point is not the points, the point is the POETRY". The only reason slam poetry is a competition is to get the audience to fill seats. Before slam, poetry readings were characteristically boring and not really an event anyone was interested in attending. By adding the competition element to poetry, slam helps to build a new, energetic, excited community around poetry. Please remind your students that, essentially, the competition is a complete and total joke. At a "real" slam, the judges should be total random people pulled in from the street or even the audience. The "judges" should be ordinary people who like poetry - not professors or other experts. The judges usually provide a "reason for selection" to the MC and those reasons are usually pretty funny! Before the start of the slam, the MC introduces the judges with lines like, "Alright everyone, it's time to meet the judges. Let's cheer for them now because later, you'll probably be pretty mad at them! Let's meet Leslie - she's qualified for judging a slam because she has a pet bulldog. Let's clap for Leslie!" Once all of the judges are introduce, they will usually judge a primary "sacrificial poet" to calibrate their scoring. Each judge has a whiteboard and is directed to score the poems on a scale of 1-10 with only one decimal place. If you are able to get five judges, you will drop the high and the low score, then total the three remaining scores for each performance. What are common themes or topics in slam poems? When I listen to the young people in Chicago speaking their truth on the stage, these poems are filled with passion. They are typically deeply in touch with a social justice issue, namely: equality, gun violence, cultural acceptance, and poverty. Poems are often about family, about how childhood has affected these students, and about their uncertain futures. The poems are optimistically hopeful and painfully despondent. The answer is, there is no common theme or topic, but the poems are deeply personal to each and every poet. And you can FEEL IT. You can feel it coming out of their souls on stage. If your students are searching for a slam poem topic, have them start with where they're from, a story from their lives. If they're faking their passion in the poem, the audience will know right away. How does one "win" a poetry slam? At the end of the slam, all of the points have been added up for each poet. The top TWO poets move on to the final round. In this round, the audience chooses a completely random topic by shouting them out to the MC. The MC chooses one of them, let's say "hippos", and then gives the two final poets two minutes to write a new poem on the topic of "hippos". At the end of two minutes, the poets read and the audience decides on their winner based on the almighty applause-o-meter. 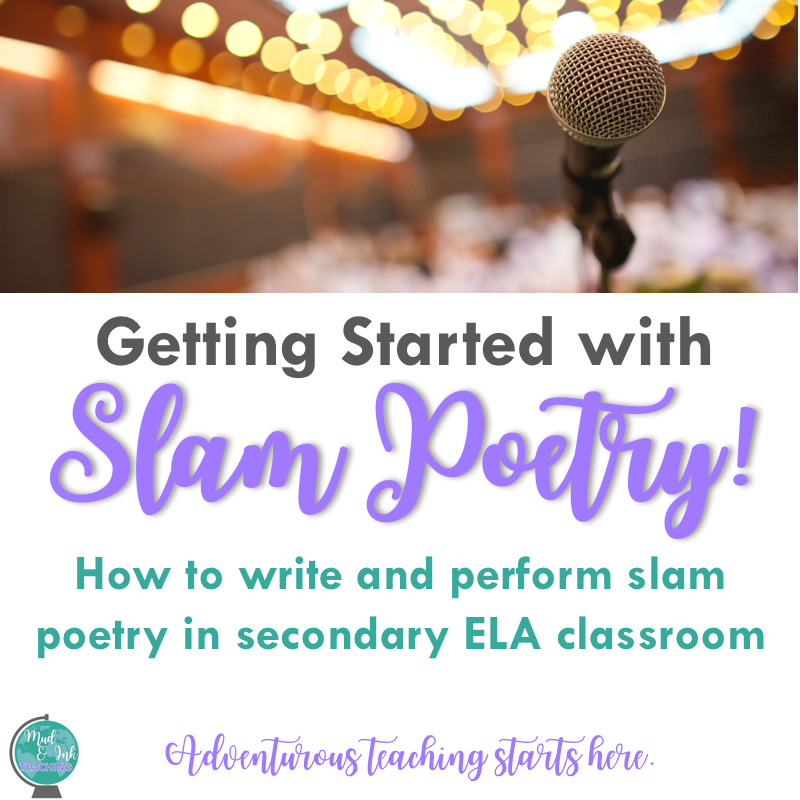 How can I host a slam in my classroom? Let me stop you right there. First, you need to decide what kind of atmosphere you want in your classroom. An OPEN MIC might be a better option for some teachers: at an open mic, all students read their poems aloud to the class, no judges, no scores, no competition. My recommendation would be starting with an open mic, and then have students vote on the top 10 students they'd like to see compete in a SLAM. Those 10 students would need to have another poem ready to perform, so consider having your students prepare TWO poems: one for open mic and another in case they are selected for the class slam! Next, pick your slam day, pick your judges, and come up with a fun prize for the winner. Voila! Need a helping hand? Here's a quick, free, one-pager ready to download and print. Get your students writing slam poetry today! How to Write a Slam Poem: download freebie!